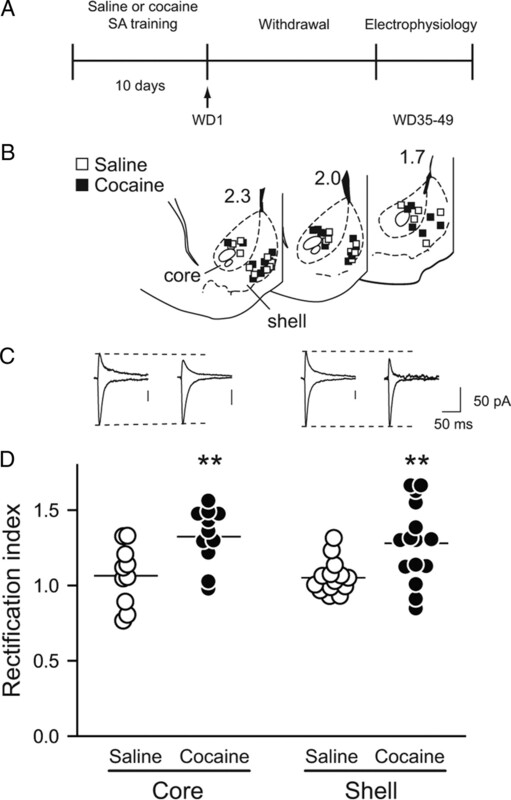 Repeated noncontingent cocaine injections, which lead to behavioral sensitization, increase AMPA receptor (AMPAR) transmission in the rodent nucleus accumbens (NAc) in a withdrawal-dependent manner. On withdrawal days (WD) 10–21, this is attributable to upregulation of GluA1A2-containing AMPARs. However, synaptic incorporation of GluA2-lacking/Ca2+-permeable AMPARs (CP-AMPARs) was observed after longer withdrawal (WD35) from repeated noncontingent cocaine injections in young mice (Mameli et al., 2009). CP-AMPARs had previously been observed in NAc synapses only after prolonged (WD30–WD47) withdrawal from extended-access cocaine self-administration. Our goal was to determine whether rats receiving repeated noncontingent cocaine injections during adulthood similarly exhibit CP-AMPARs in the NAc after prolonged withdrawal. For comparison, we began by evaluating CP-AMPARs on WD35–WD49 after extended-access cocaine self-administration. Confirming our previous results, whole-cell recordings revealed inwardly rectifying AMPAR EPSCs, a hallmark of CP-AMPARs. This was observed in both core and shell. Next, we conducted the same analysis in adult rats treated with eight daily noncontingent cocaine injections and recorded on WD35–WD49. AMPAR EPSCs in core and shell did not show inward rectification and were insensitive to 1-naphthylacetylspermine (a selective antagonist of CP-AMPARs). Locomotor sensitization could still be demonstrated after this long withdrawal period, although the upregulation of GluA1A2-containing AMPARs observed at earlier withdrawal times was no longer detected. In conclusion, in adult rats, accumulation of synaptic CP-AMPARs in the NAc occurs after prolonged withdrawal from extended-access cocaine self-administration but not after prolonged withdrawal from noncontingent cocaine injections. Many studies of cocaine-induced neuroadaptations have used repeated experimenter-administered (noncontingent) cocaine injections to produce behavioral sensitization (progressive augmentation of behavioral responses to cocaine). Rodents treated in this manner exhibit increased cell surface and synaptic AMPA receptor (AMPAR) levels in the nucleus accumbens (NAc). This AMPAR upregulation has been demonstrated between withdrawal day (WD) 7 and WD21 using biochemical (Boudreau and Wolf, 2005; Boudreau et al., 2007, 2009; Ghasemzadeh et al., 2009; Schumann and Yaka, 2009; Ferrario et al., 2010), electrophysiological (Kourrich et al., 2007), and behavioral (Bachtell and Self, 2008) approaches. However, the relationship between AMPAR upregulation and locomotor sensitization is complex (Wolf and Ferrario, 2010). For example, locomotor sensitization can be demonstrated on WD1, although AMPAR upregulation has not yet occurred (Boudreau and Wolf, 2005). We have hypothesized that AMPAR upregulation increases the responsiveness of NAc medium spiny neurons (MSNs) to glutamate that is released by cortical and limbic inputs in response to drugs or drug-associated cues (Wolf and Ferrario, 2010). This may help explain observations that sensitized rats subsequently acquire drug self-administration more readily and work harder to obtain drugs in progressive ratio experiments (Vezina, 2004). On WD10–WD21 after noncontingent cocaine exposure, all available data indicate that GluA1A2 receptors are responsible for the vast majority of enhanced AMPAR transmission (Boudreau and Wolf, 2005; Boudreau et al., 2007; Kourrich et al., 2007; Ghasemzadeh et al., 2009; Ferrario et al., 2010). In contrast, GluA2-lacking AMPARs are added to NAc synapses after prolonged withdrawal (30–47 d) from extended-access cocaine self-administration (contingent cocaine exposure) (Conrad et al., 2008; Mameli et al., 2009; Ferrario et al., 2011). Formation of these receptors is important because they have unique properties; they are Ca2+-permeable AMPARs (CP-AMPARs) and have higher single channel conductance than GluA2-containing receptors (Liu and Cull-Candy, 2000; Plant et al., 2006; Guire et al., 2008). The presence of CP-AMPARs at NAc synapses is therefore predicted to increase MSN responsiveness to excitatory inputs that trigger cocaine seeking. Indeed, blocking CP-AMPARs in the NAc prevents expression of incubated cue-induced cocaine seeking (Conrad et al., 2008). Recently, addition of CP-AMPARs to NAc shell synapses was observed on WD35 after repeated noncontingent cocaine injections (Mameli et al., 2009). Combined with data indicating that CP-AMPARs are added to NAc synapses on WD30–WD47 from extended-access cocaine self-administration (Conrad et al., 2008; Mameli et al., 2009; Ferrario et al., 2011), this may indicate that CP-AMPARs are added to NAc synapses regardless of whether cocaine exposure is contingent or noncontingent, provided the withdrawal time is long enough. However, in the study demonstrating CP-AMPARs in the NAc after noncontingent cocaine, cocaine treatment began when mice were juvenile [postnatal day (P) 16–P35] (Mameli et al., 2009). Because plasticity mechanisms (McCutcheon and Marinelli, 2009) and CP-AMPAR abundance (Ho et al., 2007) change during development, it is important to determine whether CP-AMPARs are added to NAc synapses when rodents are sensitized with noncontingent cocaine injections as adults. Here, we undertook studies to test this possibility, and to compare AMPAR plasticity in NAc core and shell subregions. Adult male Sprague Dawley rats (275–300 g on arrival; Harlan) were habituated to the animal facility for ∼1 week before use. They were housed two to three per cage until catheter implantation (single housing thereafter) and maintained on a 12 h light:dark cycle (lights on at 7:00 A.M.). All experiments were approved by the Institutional Animal Care and Use Committee of Rosalind Franklin University of Medicine and Science. Procedures were as in our previous report (Conrad et al., 2008). Briefly, rats self-administered cocaine 6 h/d for 10 d in operant chambers (Med Associates). Nose-poking in the active hole delivered an infusion of saline or cocaine (0.5 mg/kg/100 μl over 3 s), paired with a 30 s light cue inside the nose-poke hole. Nose-poking in the inactive hole had no consequences. After the last training session, rats were returned to their home cages for 35–49 d before electrophysiological analysis. Noncontingent cocaine treatment and assessment of behavioral sensitization. Rats received repeated injections (i.p.) of cocaine (15 mg/kg; Sigma-Aldrich) or saline (0.9%, 1 ml/kg) for 8 consecutive days. On each day, rats were placed in photocell cages (San Diego Instruments), habituated for 40 min, and injected with cocaine or saline. Locomotor activity (beam breaks) was measured for 40 min. After this regimen, rats remained in home cages until they were either tested for expression of sensitization or killed for biochemical or electrophysiological analysis (see below). To test for long-lasting sensitization, a subset of rats received a challenge injection of cocaine (15 mg/kg) on WD41 in photocell cages. Three days later (WD44), the same animals were challenged with a lower dose of cocaine (7.5 mg/kg). Cell surface and intracellular AMPAR subunit levels were determined using a protein cross-linking assay. Rats were taken directly from home cages and killed. A 2 mm coronal section containing the NAc was obtained using a brain matrix (ASI Instruments). A tissue punch was used to obtain the core (final diameter, ∼1.75 mm) and then a scalpel was used to cut a crescent-shaped piece of tissue (shell) medial to the core punch (for a schematic of the dissection, see Fig. 3B). Tissue samples were quickly minced with a scalpel and then incubated for 30 min at 4°C with 2 mm bis(sulfosuccinimidyl)suberate (BS3; Pierce Biotechnology). BS3 is a bifunctional, cross-linking reagent that does not cross membranes. Therefore, it selectively modifies surface-expressed proteins, increasing their apparent molecular weight and enabling them to be separated from unmodified intracellular proteins by SDS-PAGE and quantified by immunoblotting (for detailed procedures, see Ferrario et al., 2010). Blots were processed exactly as described previously (Ferrario et al., 2010) using primary antibodies to GluA1 (PA1–37776; Affinity Bioreagents), GluA2 (AB1768; Millipore), or GluA3 (3437; Cell Signaling Technology) and chemiluminescence detection. Values (diffuse densities) for surface, intracellular, and total (surface + intracellular) protein levels were normalized to a loading control (GADPH; CB1001; Calbiochem). For each of these measures (surface, intracellular, and total protein) in each experiment, values from the cocaine group were expressed as a percentage of the mean value for a saline group run in parallel and killed on the same day. Rats were taken directly from their home cages and anesthetized with chloral hydrate (400–600 mg/kg, i.p.). Brains were rapidly removed and coronal slices (300 μm) were cut using a vibrating blade microtome (VT1200S; Leica) in ice-cold sucrose-based cutting solution (in mm: 200 sucrose, 20 glucose, 25 NaHCO3, 2.5 KCl, 1 CaCl2, 2.5 MgCl2, 1 NaH2PO4, 10 ascorbic acid). Slices were held in an incubation chamber containing warm (32–34°C) artificial CSF (aCSF; in mm: 120 NaCl, 20 glucose, 25 NaHCO3, 2.5 KCl, 0.5–2.5 CaCl2, 1–4 MgCl2, 1 NaH2PO4, 1 ascorbic acid) with (2R)-amino-5-phosphonopentanoate (APV; 50 μm) for at least 1 h after slicing. For recordings, slices were placed in a recording chamber and constantly perfused with warm (32–34°C) aCSF containing picrotoxin (100 μm) and APV (50 μm). Patch pipettes (4–6 MΩ) were filled with a cesium-based solution (in mm: 140 CsCl, 10 HEPES, 2 MgCl2, 5 Na2ATP, 0.6 NaGTP, 2 QX-314, 0.1 spermine) with 0.1% neurobiotin. All drugs and reagents were obtained from Sigma-Aldrich. MSNs were initially identified by their morphology, after patching by a slow ramp to threshold in response to depolarizing current and then, finally, by post hoc histological identification. Data were collected using an Axopatch 200B (Molecular Devices). Signals were filtered at 2 kHz, digitized at 10 kHz, and recorded onto a computer using pClamp 9.2 software (Molecular Devices). pClamp 9.2 was used for analysis. A bipolar tungsten stimulating electrode placed ∼300 μm from recording site was used to evoke EPSCs (0.2 ms pulse, every 20–30 s). EPSCs were gathered at −70 mV, +40 mV, and at the reversal potential (Erev). The rectification index for each cell was calculated using the following formula adapted from Kamboj et al. (1995): [EPSC−70 mV/(−70 − Erev)]/[EPSC+40 mV/(+40 − Erev)]. Slice histology was performed as previously reported (Conrad et al., 2008). Behavioral data were analyzed using repeated-measures ANOVA. Western blot data were analyzed using unpaired t tests. Electrophysiology data on rectification indices and 1-naphthylacetylspermine (Naspm) sensitivity were analyzed using two-way ANOVA considering treatment (saline vs cocaine) and subregion (core vs shell) as independent factors. Cells were treated as independent observations and each group contained cells from at least three animals. Whole-cell patch-clamp recording was used to assess the presence of CP-AMPARs in core and shell subregions of the NAc after prolonged withdrawal (WD35–WD49) from extended-access cocaine self-administration. This self-administration paradigm is known to produce withdrawal-dependent intensification (incubation) of cue-induced cocaine seeking (Lu et al., 2004) and leads to the accumulation of CP-AMPARs in NAc core synapses (Conrad et al., 2008; Ferrario et al., 2011). Consistent with this prior work, AMPAR EPSCs from NAc MSNs in rats that had self-administered cocaine showed strong rectification whereas EPSCs from saline self-administering rats did not (saline: 1.06 ± 0.03, n = 24; cocaine: 1.30 ± 0.05 n = 26; main effect of treatment, F(1,46) = 18.450, p < 0.001). Rectification was similar in core and shell (no effect of subregion, F(1,46) = 0.294, p = 0.590, or drug × subregion interaction, F(1,46) = 0.049, p = 0.825) (Fig. 1). Ca2+-permeable AMPARs are present in NAc synapses after prolonged withdrawal from extended-access cocaine self-administration. A, Timeline: On WD35–WD49 after the end of self-administration (SA) of cocaine or saline, rats were killed (without any further drug exposure) for electrophysiology experiments. B, Location of recorded cells in NAc core and shell. Numbers on sections are distance (in millimeters) from bregma. C, Representative traces showing AMPAR EPSCs recorded at −70 and +40 mV. Dotted line indicates peak of current in saline-pretreated rat to facilitate comparison with cocaine-pretreated rat. Groups are as indicated in D. D, The average rectification index of AMPAR EPSCs was greater in NAc cells from cocaine-pretreated rats relative to saline-pretreated rats in both core and shell. Each circle represents one cell. Lines are means for each group. **p < 0.01 versus saline. Rats received daily injections of cocaine (15 mg/kg) or saline on eight consecutive days in a photocell cage. Cocaine-pretreated rats developed locomotor sensitization as evidenced by a main effect of days (days 1 and 8, WD41; F(2,20) = 9.0730, p = 0.002) (Fig. 2B). Locomotor activity was higher on day 8 than it was on day 1 (Tukey test, p = 0.001) and was still elevated when rats were challenged with cocaine on WD41 (day 1 vs WD41, p = 0.028). Additionally, when tested on WD44 with a lower dose of cocaine (7.5 mg/kg) to avoid any contribution of stereotyped behaviors, cocaine-pretreated rats showed a greater locomotor response than saline-pretreated controls (main effect of treatment, cocaine vs saline; F(1,20) = 8.7390, p = 0.008) (Fig. 2C). Thus, locomotor sensitization produced by our cocaine regimen persists at least 6–7 weeks. 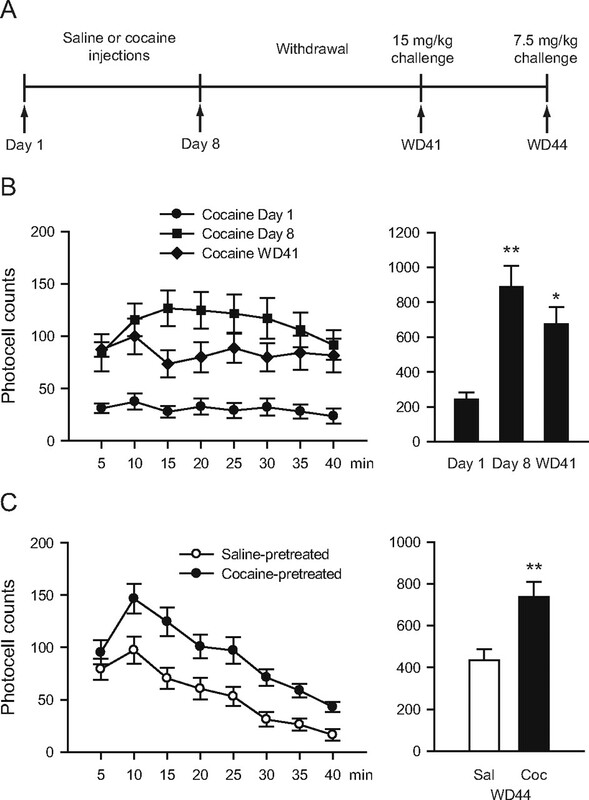 Locomotor sensitization to cocaine persists through WD44. A, Timeline: Rats were treated with saline or cocaine (15 mg/kg) for 8 d. On WD41, rats received a challenge injection of cocaine (15 mg/kg); 3 d later (WD44), they were challenged with a lower dose of cocaine (7.5 mg/kg). B, Locomotor activity in response to 15 mg/kg cocaine on treatment days 1 and 8, and WD41. Data are mean number of beam breaks for 5 min intervals during the first 40 min after cocaine injection (left) and total beam breaks summed over this period (right). **p < 0.01, *p < 0.05 versus day 1. C, Locomotor activity in response to 7.5 mg/kg cocaine on WD44. Data are plotted as in B. The cocaine group showed a greater locomotor response during the 40 min after cocaine (Coc) injection compared with the saline (Sal) group. **p < 0.01 versus saline. n = 11/group. A protein cross-linking assay was used to measure surface and intracellular AMPAR subunit levels. In a previous study, using the same assay and cocaine regimen but assessing rats on WD14, we demonstrated increased surface expression of GluA1 and GluA2 in the NAc (a mixed core/shell dissection was used) (Ferrario et al., 2010). Using very similar regimens, we and others (see Introduction, above) had found GluA1 and GluA2 upregulation from WD10–WD21, but not on WD1. Here, we determined GluA1, GluA2, and GluA3 surface and intracellular levels at a later withdrawal time (WD41) in core and shell subregions. To our surprise, we found no significant differences in AMPAR subunit surface expression between cocaine-pretreated and saline-pretreated groups (p > 0.05 for GluA1, GluA2, and GluA3 in core and shell) (Fig. 3C). These results, combined with previous studies, indicate that cell surface levels of GluA1A2-containing AMPARs increase during the first weeks of withdrawal but then return to normal some time between WD21 and WD44. However, it remains possible that a small number of CP-AMPARs are added to NAc synapses independently of this normalization. Such an effect might be below the limit of detection of our biochemical methods. Therefore, we performed electrophysiological studies to more definitively test for the presence of CP-AMPARs. AMPAR subunit distribution in NAc core and shell after 41 d of withdrawal from noncontingent cocaine injections. A, Timeline: Rats were treated with saline or cocaine (15 mg/kg) for 8 d. On WD41, rats were killed (without any further drug exposure) for analysis of AMPAR subunits using a protein cross-linking assay. B, Schematic of core and shell dissections. C, Cell surface, intracellular (Intra), and total levels of GluA1, GluA2, and GluA3 in core and shell. Rats treated with repeated noncontingent cocaine injections did not differ significantly from saline controls. Data from the cocaine group were normalized to the mean of the saline group. Error bars show SEM. *p < 0.05 versus saline. n = 16–18/group. Whole-cell patch-clamp recordings were conducted in NAc slices prepared after the same noncontingent cocaine regimen and a similar withdrawal period (35–49 d) as the biochemical studies described above. The results indicated that this treatment did not lead to accumulation of CP-AMPARs in the NAc. Thus, AMPAR-mediated EPSCs recorded from cocaine-pretreated animals exhibited linear current–voltage relationships and rectification indices (RIs; see Materials and Methods) that did not differ from those of saline-pretreated animals (saline: 1.01 ± 0.04, n = 21; cocaine: 1.04 ± 0.04 n = 19; no effect of treatment, F(1,36) = 0.085, p = 0.773). Similar results were found in both NAc core and shell subregions (no effect of subregion, F(1,36) = 3.171, p = 0.083, or treatment × region interaction, F(1,36) = 1.468, p = 0.233) (Fig. 4). Furthermore, when we bath-applied Naspm (100 μm), a selective blocker of CP-AMPARs, we observed only a small decrease in the EPSC that did not differ due to pretreatment or subregion (percentage inhibition: saline core, 11.3 ± 6.2; cocaine core, 12.0 ± 3.2; saline shell, 10.1 ± 5.1; cocaine shell, 9.2 ± 4.2; no effect of treatment, F(1,13) = 1.064, p = 0.321; or subregion, F(1,13) = 0.274, p = 0.610; or treatment × subregion interaction, F(1,13) = 0.185, p = 0.674), consistent with a small Naspm effect in saline-pretreated rats in our prior study (Conrad et al., 2008). Together, these results indicate that the synaptic AMPAR current is predominantly carried by GluA2-containing receptors even after prolonged withdrawal from noncontingent cocaine administration. Ca2+-permeable AMPARs are not added to NAc synapses after prolonged withdrawal from noncontingent cocaine. A, Timeline: On WD35–WD49, after noncontingent cocaine or saline, rats were killed (without any further drug exposure) for electrophysiology experiments. B, Location of recorded cells in NAc core and shell. Numbers on sections are distance (in millimeters) from bregma. C, Representative traces showing AMPAR EPSCs recorded at −70 and +40 mV. Dotted line indicates peak of current in saline rats. Groups are as indicated in D. D, No difference was observed between saline- and cocaine-pretreated rats in the rectification index of AMPAR EPSCs from NAc cells in NAc core or shell. Each circle represents one cell. Lines are means for each group. Here we show that in adult rats, the effects of cocaine on AMPAR transmission are dependent on whether drug exposure is contingent or noncontingent, and not simply on the length of withdrawal. Specifically, CP-AMPARs are increased at NAc synapses in both core and shell subregions after long withdrawal from extended-access cocaine self-administration. In contrast, CP-AMPAR levels are very low after the same duration of withdrawal from noncontingent cocaine treatment. Thus, synaptic accumulation of CP-AMPARs in the NAc is not a general consequence of cocaine exposure and prolonged withdrawal. Previous studies, many of them conducted in adult rodents, have consistently implicated GluA1A2 receptors, not GluA2-lacking CP-AMPARs, in the potentiation of NAc AMPAR transmission that occurs after withdrawal from repeated noncontingent cocaine injections (see Introduction, above; and Biochemical studies of AMPAR surface expression in rodents exposed to noncontingent cocaine, below). However, these studies were performed on WD10–WD21. A recent paper reported that CP-AMPARs were present in the NAc shell on WD45 after repeated noncontingent cocaine exposure in juvenile mice (P16–P35) (Mameli et al., 2009). This study raised the possibility that duration of withdrawal determines the type of AMPAR that undergoes upregulation after noncontingent exposure to cocaine. However, this is not the case in adult rats. Our results show that accumulation of CP-AMPARs in the adult rat NAc occurs after extended-access cocaine self-administration but not after repeated noncontingent cocaine injections. Thus, rather than depending on withdrawal time, our results suggest that contingent and noncontingent cocaine exposure lead to different AMPAR plasticity in the adult NAc, although the overall level of cocaine intake may also contribute. This is in agreement with prior studies indicating different consequences of these two modes of drug exposure throughout the reward system (Jacobs et al., 2003) and specifically in the NAc (Mu et al., 2010). In reconciling our results on noncontingent cocaine exposure with those of Mameli et al. (2009), differences in species and age of experimental subjects are potentially important (adult rats in our study, P16–P35 mice in their study). A role for species differences cannot be ruled out. However, age is a particularly important variable with respect to plasticity mechanisms (Ho et al., 2007; McCutcheon and Marinelli, 2009) and is therefore more likely to explain the difference. For example, CP-AMPARs are abundant in NAc MSNs cultured from postnatal day 1 rats (Sun and Wolf, 2009). However, they represent a small minority of AMPARs in the NAc of drug-naive adult rats (Boudreau et al., 2007; Conrad et al., 2008; Reimers et al., 2011). In the two previous electrophysiological studies of synaptic AMPARs after extended-access cocaine self-administration, synaptic CP-AMPARs were detected in core (Conrad et al., 2008) or shell (Mameli et al., 2009), but the two subregions were not directly compared in either study. The present study therefore extends these results by showing that CP-AMPARs are detected to the same extent (based on RI) in core and shell subregions. This supports biochemical data indicating CP-AMPAR formation in both subregions (Conrad et al., 2008). It is noteworthy that, in both of these studies, extended-access cocaine self-administration occurred when rodents were adults, although Conrad et al. (2008) used rats and Mameli et al. (2009) used mice. This also points to age rather than species as a critical variable affecting the involvement of CP-AMPARs in cocaine-induced plasticity. Prior biochemical studies, conducted in rats on WD14–WD21 after repeated noncontingent cocaine injections, indicated upregulation of surface and synaptic GluA1 and GluA2 (Boudreau and Wolf, 2005; Boudreau et al., 2007; Ghasemzadeh et al., 2009; Schumann and Yaka, 2009; Ferrario et al., 2010), although one study suggested a very small increase in CP-AMPAR levels in total tissue homogenates (Boudreau et al., 2007). Upregulation of GluA1 was also detected at an earlier time (WD7) but GluA2 was not evaluated (Boudreau et al., 2009). Most of the biochemical studies were performed with mixed core/shell dissections, but one study provided evidence that GluA1A2 upregulation occurs in both subregions (Ghasemzadeh et al., 2009). Consistent with upregulation of GluA1A2 receptors, increased AMPA/NMDA ratios and linear current–voltage relationships were found in mouse NAc shell MSNs recorded on WD10–WD14 (Kourrich et al., 2007). Together, these results demonstrate upregulation of GluA1A2-containing AMPARs in core and shell subregions of both mice and rats receiving noncontingent cocaine injections and evaluated on WD10–WD21. 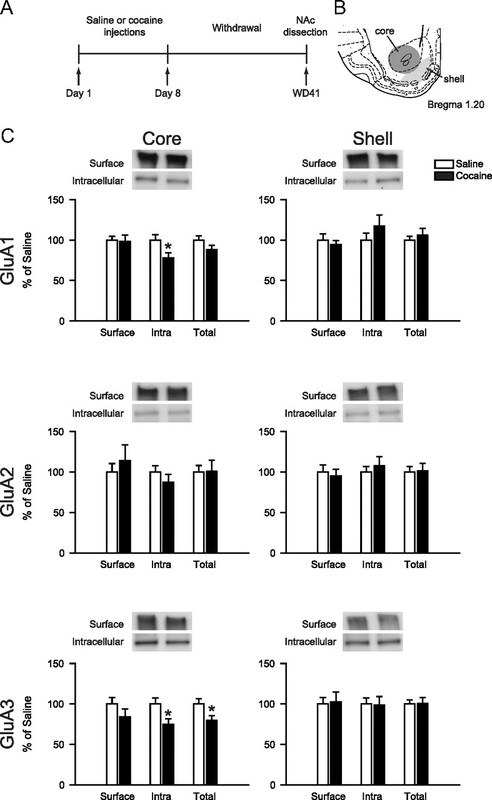 In the present study, conducted on WD41 after noncontingent cocaine injections, we found that surface AMPAR upregulation is no longer detected, suggesting that cell surface levels of GluA1A2 receptors normalize some time between WD21 and WD41. Locomotor sensitization was still detected on WD41–WD44. Thus, our results add to evidence that AMPAR upregulation and locomotor sensitization are dissociable (Bachtell and Self, 2008; Ferrario et al., 2010; Wolf and Ferrario, 2010). In light of the hypothesized role of AMPAR upregulation in incentive sensitization (see Introduction, above), it will be interesting to determine whether the persistence of AMPAR upregulation during withdrawal from noncontingent cocaine correlates more closely with the persistence of incentive–motivational changes that have been demonstrated in sensitized rats. It is important to understand which neuroadaptations are produced by various animal models of addiction, because this helps define whether and how a particular neuroadaptation can be targeted for therapeutic purposes. The present work identifies formation of CP-AMPARs as a neuroadaptation that, in adult rats, is selectively linked to withdrawal from extended-access cocaine self-administration. This situation resembles that of human cocaine addicts who become abstinent for a month or more due to hospitalization or incarceration. Our prior demonstration that blocking CP-AMPARs decreases the expression of incubated cue-induced craving in rats (Conrad et al., 2008) suggests that a similar strategy may be useful in this patient population. Although our results show that adult rats treated with noncontingent cocaine do not exhibit synaptic CP-AMPARs, even after prolonged withdrawal, Mameli et al. (2009) have shown that noncontingent cocaine exposure in juvenile mice is sufficient to elicit synaptic incorporation of CP-AMPARs (Mameli et al., 2009). This is an intriguing observation that may help explain greater addiction vulnerability in the developing brain. This work was supported by National Institutes of Health Grants DA009621, DA015835, and DA029099 to M.E.W., and DA020654 and DA020654–04-S1 to M.M. We thank Kerstin Ford and Michael Milovanovic for assistance with these experiments. (2008) Renewed cocaine exposure produces transient alterations in nucleus accumbens AMPA receptor-mediated behavior. J Neurosci 28:12808–12814. (2011) Alterations in AMPA receptor subunits and TARPs in the rat nucleus accumbens related to the formation of Ca2+-permeable AMPA receptors during the incubation of cocaine craving. Neuropharmacology, Advance online publication. Retrieved March 31, 2011. doi:10.1016/j.neuropharm.2011.01.021. (2009) Behavioral sensitization to cocaine is associated with increased glutamate receptor trafficking to the postsynaptic density after extended withdrawal period. Neuroscience 159:414–426. (2008) Recruitment of calcium-permeable AMPA receptors during synaptic potentiation is regulated by CaM-kinase I. J Neurosci 28:6000–6009. (2003) Neuroadaptive effects of active versus passive drug administration in addiction research. Trends Pharmacol Sci 24:566–573. (2004) Incubation of cocaine craving after withdrawal: a review of preclinical data. Neuropharmacology 47(Suppl 1):214–226. (2009) Cocaine evoked synaptic plasticity: persistence in the VTA triggers adaptations in the NAc. Nat Neurosci 12:1036–1041. 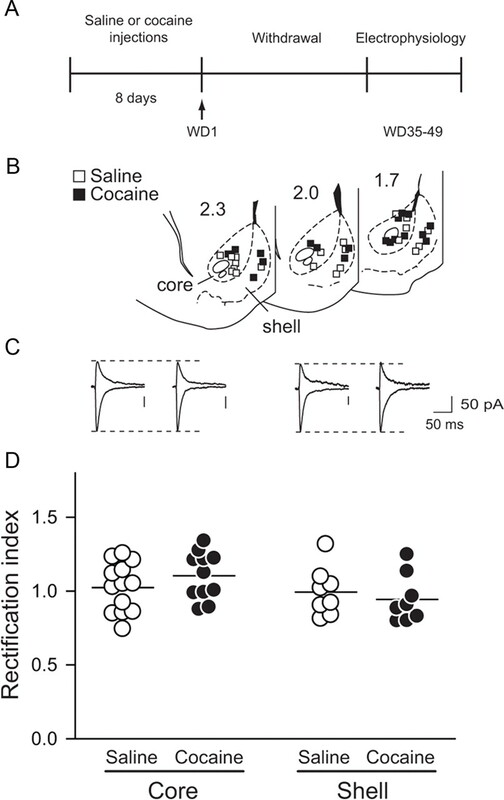 (2010) Exposure to cocaine dynamically regulates the intrinsic membrane excitability of nucleus accumbens neurons. J Neurosci 30:3689–3699. (2011) Quantitative analysis of AMPA receptor subunit composition in addiction-related brain regions. Brain Res 1367:223–233. (2009) Prolonged withdrawal from repeated noncontingent cocaine exposure increases NMDA receptor expression and ERK activity in the nucleus accumbens. J Neurosci 29:6955–6963. (2009) Nucleus accumbens neurons exhibit synaptic scaling that is occluded by repeated dopamine pre-exposure. Eur J Neurosci 30:539–550. (2004) Sensitization of midbrain dopamine neuron reactivity and the self-administration of psychomotor stimulant drugs. Neurosci Biobehav Rev 27:827–839.